Here we go again. Just like in 2009, on the eve of a major UN climate conference some hacker or group of hackers released a bunch of emails illegally obtained from a server belonging to the University of East Anglia’s Climatic research unit (CRU), with the hopes of derailing the UN talks, or at least creating uncertainty about climate science amongst the public. The incident in 2009 was termed climategate, and although it caused much uproar at the time —the media loves a controversy and played it up for all it was worth— the string of inquiries that came out of the climategate incident showed that the scientists involved had done nothing wrong. The aims of these email hacks may be plainly transparent but, at least last time, they were successful. Not in overturning any climate science, but in raising doubts the public’s mind. It is worth repeating same sentiment I had in 2009 after the original emails were hacked. If you are alleging that climatology is flawed then the proper response is more science not hacked emails. Emails, regardless of what they might say, do not have the capability to overturn decades of climate science done by thousands of individual scientists. The independent Climate Change Email review headed by Sir Muir Russell cleared the scientists and dismissed the allegations they data had been manipulated, finding that the “rigour and honesty” of the scientists at the Climatic Research Unit were not in any doubt. The UK House of Commons Science and Technology committee inquiry found that Professor Phil Jones (head of CRU at the time) had “no case to answer“, that his reputation “remains intact“, and that the emails and claims raised in the controversy did not in any way challenge the scientific consensus that “global warming is happening and that it is induced by human activity“. An inquiry by Penn State university into the actions of Michael Mann (principal author of now famous hockey stick graph) cleared him of 3 out of 4 charges leveled against him. It didn’t rule on the 4th charge saying it would need to investigate further. The National Science foundation also investigated and exonerated Michael Mann and upheld the conclusions of the investigations conducted by Penn State university. 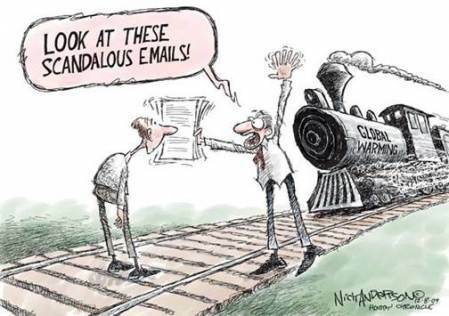 The Conservative government in the UK formally declared that “the information contained in the illegally-disclosed emails does not provide any evidence to discredit the scientific evidence of anthropogenic climate change”. And finally at the behest of the US Senate’s arch denier Senator Inhofe, the Department of Commerce’s Inspector General also investigated and “did not find any evidence that NOAA inappropriately manipulated data or failed to adhere to appropriate peer review procedures”. The investigation done at the request of Senator Inhofe is the most interesting to me. Not for any scientific reason as I doubt the Inspector General at the Department of Commerce is the most qualified person to pass judgement on such matters, but because presumably Senator Inhofe picked the venue most likely to be sympathetic to his (obviously wrong) opinions of what the climategate emails revealed. And even they were unable to dig up any dirt on the scientists involved. More importantly in the two years since the climategate emails were stolen and released to the public no single scientific institution has changed it’s stance on the issue. In fact no scientific body of national or international standing rejects the notion of human caused climate change. You know how the old saying goes: “Fool me once shame on you, fool me nine times shame on me”. So what about these new emails? Do they reveal anything new? The first thing to note is that these emails are not new. They are all from the same period of time as the original emails, and involve mostly the same scientists, so if you have been paying attention you might be very tempted to say no, they don’t. Bradley was one of the authors of the original hockey stick graph, along with Michael Mann. But he clearly thinks that a subsequent reconstruction (which largely agrees with his own) done by his former collaborator is not very good. He says so in very strong language, and when asked about it by the New York Times he stood by his earlier complaints and made it clear that he expressed his disagreement directly to Michael Mann. This example, and many more contained within the emails, show a healthy skepticism within the scientific community. Results from colleagues are not automatically accepted, and vigorous discussions using very harsh language about the validity of new research papers is common amongst climatologists. This is in sharp contrast to the way the climate community is portrayed by the so-called auditors. But is also points to the fact that even when dealing with respected members of the climate community scientists don’t hold back from using strong language. So if they are willing to call the work of highly respected scientists and close colleagues pathetic, it should come as no surprise that when talking about the work of, shall we say less than respected people who take every opportunity to turn molehills into mountains, the language is at least equally strong and harsh. Last time the media pumped up the supposed controversy without bothering to check if the controversy was legitimate or manufactured, and as the string of inquiries found that the scientists had done nothing wrong it became clear that they were made to look like fools. This time around the media is displaying, much like the scientists in the emails, a healthy dose of skepticism, realizing that these emails are nothing more than a distraction from what really matters. Looks like more whitewash being splashed around in this article. I do agree, much more, much better science is needed,just not by this group of politicized science E-mail authors. I would not call them scientists. The “thousands of individual scientists” you speak of should disown this group of dishonest climate alchemists. That’s a pretty marginal comment. It says what you believe, but not why you believe it. And it’s on a topic we hope to avoid. So ordinarily it would get rejected. However, this article is already a bit of an exception, so your comment presents an opportunity to clarify how we approach all this. Planet3.0 doesn’t intend to pursue the whole set of controversies around the stolen emails. It’s true that, for all the trumped up controversies and twisted context, some actual mistakes have come to light as a result of the revealed emails. We stipulate that. I think everybody does. But what should we do about it? First of all, the idea that one should be expected to disavow people (as opposed to mistakes) is not part of the way science has progressed in the past. As for the mistakes, normally they are handled quietly and within the community, not trumpeted for the demands of people who have proven themselves uninterested in the actual science, except for purposes of embarrassing the scientists. People make mistakes. Some are more error-prone than others. The more people try to achieve, the more mistakes they make. Science deals with bad form like any other civilized group does, mostly internally, and mostly by rewarding better behavior. Politics deals with mistakes by hanging them around people’s necks and humiliating them until the end of time. It’s another example of how science makes progress and politics doesn’t. We are interested in actually making progress on politics by paying attention to science. So we have no intention on dwelling on mistakes, and no interest in denunciations. We are interested in connecting good science to good policy. The crucial point is the one made by the cartoon: that very little is changed in the balance of evidence by the revelations in the stolen emails, that the balance of evidence is something that needs to be acted upon, and that the attention to the stolen emails is primarily a diversionary tactic adopted by those with something to lose once the public wakes up to the seriousness of the problem. So let’s just try to get it right in the future, okay? One element that I feel has not been sufficiently addressed is the dynamics of politicization. I tend to agree that the majority of scientists, and maybe more so in fields connected to the environment are more liberal or “left” leaning than the general public, and are therefore more likely to interpret science related policy action from a liberal viewpoint. Certainly when I first heard of this issue in the late 70’s it was from environmentalist scientists who indicated that this was a “tragedy of the Commons” type of problem, and they were convinced that this would need to be an issue that would have to be resolved by co-oridnated government action. However the argument that because of their political biases scientists are consciously manipulating data and forming a cabal that will only allow evidence that supports ACC has no support that I can see. And these email leaks seem to me almost absolute proof that there is no conspiracy. My main problem with the analysis of people like Curry and Pilke is that they do not acknowledge the effect of the extreme politicization of the denier extremists. people like Delingpole, Morano, JoNova, and Goddard have created a propaganda narrative that is so politically extreme and out of touch with reality that it created a strongly protective response from the main scientists associated with ACC. it is NOT unreasonable for climate scientists to consider these people enemies, who are focused on distorting science to fit their political agenda. This creates a polarization, and takes the issue of scientific ethics out of its normal framework. Now I am NOT saying that it justified the avoidance of FOI requests, or the consideration of censorship that was apparent in some of the emails, but it easily explains the rancor and disdain that these scientists feel toward these deniers. These feelings are totally justified, in that it is apparent to me that McKittrick, McIntyre, and some others are solely interested in disproving ACC, and showing the corruption of climate scientists whether is exists or not. Being as scientists are human, and this is such an important issue, it is quite understandable that ideology is going to be ossified around this issue by all of those involved, and professional reputation and ego are going to be defended mightily. I see that McIntyre has just made ANOTHER post showing how unethical the “hide the decline” graphic was, and the mostly intelligent commenters are already frustrated at the lack of prosecution and reinforcing each others belief in massive corruption. This sort of behavior which has been going on for over a decade and gotten more intense in the last 5 years has to lead to intense polarization, so that supporters of ACC are going to be emotionally invested in seeing results that support it, and deniers are going to go to greater and greater lengths to disprove it. It is emotionally difficult to accept that you “enemy” is right about what you have based your career on. That it is a lie, or at best a huge mistake. To me the difference is that the culture of science and the importance of scientific integrity has been a much greater brake on unethical science coming from the scientists who support ACC. Also the denier or skeptic scientists are not so unethical that they are willing to deny the physics of CO2, yet some ARE willing to allow followers to assert almost anything (But I have seen Spencer deride commenters that dispute CO2 as being a trace gas with no possible effect), and People like Goddard and Jonova pretty much encourage the most unscientific arguments as long as they undermine ACC. At the same time I DO see scientists objecting to Hansen contemplating 5 meter sea level rise, or arctic sea ice disappearing by 2015, and especially flagrant mistakes like the Greenland Atlas fiasco. There is also quite vigorous discussion about numerous scientific studies that impact climate sensitivity. However because of political ideology, on the denier side, there is almost no criticism of any argument as long as it is opposed to ACC. In spite of the emotional issues, I do not see climate scientists attacking the authors of the CERN experiments or the Shmittner paper, but they have accurately predicted the ways that those studies would be distorted. So while there IS a strong polarization, and I do think it increases bias and rigidity in thinking among climate scientists to some degree, there is just no evidence for corruption, and in fact their actions have been, on the whole, more reasonable than one might expect. that said, I consider myself a skeptic and do gain some insight from even the most extreme denier sites, and must say that because of them I know a lot more about this issue – Both the science and the politics. I enjoyed reading your comment. I have to say that it is rare, in my experience, to read such an even-handed comment from a self-identified “skeptic.” Would you mind elaborating a bit on the nature or your skepticism? I would say that most people who call themselves skeptics would consider me a rabid alarmist. Certainly I have been called much worse on denier websites. But I do think that there is at least a pause in recent warming, and I don’t think we know exactly why that is. But it is quite reasonable that temp changes will not be linear with CO2 increase. If temps do not increase or actually go down in the next ten years, then I definitely think current ACC models have a serious problem. I also think that there are potentially mitigating homeostatic effects that we do not fully understand, particularly biological ones. Along these lines I just posted a comment at realclimate about a study from Cornell that indicates aerosols in the atmosphere are reducing the effect of CO2, and that their deposition on the land and oceans is allowing what they refer to as biogeochemical processes to sequester more CO2 than would normally be expected. Also I am happy to consider most denier arguments more than most “warmists”. That being said my scientific and mathematical skills are way below the level necessary to compare on my own the various technical arguments, but I do have a good sense of logic and the reasonability of arguments. And I am well versed in issues related to ideology distorting ones ability to accept facts. Tony, re “Hansen contemplating 5 meter sea level rise,” well, contemplating, sure, but the context was a comment from him saying that he thought such a figure was more probable than the AR4 figure, at the same time pointing out that neither modeling nor paleo studies constrain the maximum rate at which ice sheets can collapse. Note that just a few years ago it was widely thought among glaciologists that it would take millennia, whereas now a few centuries seems to be the common view. It doesn’t give one confidence that further downward revisions won’t be forthcoming. Re “arctic sea ice disappearing by 2015,”, that refers to the work of the U.S. Navy’s sea ice modeler, who estimates 2016 +/- 3 years. Views do vary on how likely that is, but considering recent trends it’s hard to call him an alarmist. Considering that it wasn’t long ago that the sea ice was considered to be in no danger at all of having a summer hiatus soon, it’s ironic that the “skeptical” stance is to side with the shrinking number of scientists saying more like mid-century. More ironic is that the latter grouping seems to be mainly composed of scientists sticking with their GCM results, notwithstanding that only one model’s error bars manage to (barely) graze the error bars of the measured trend. no real argument with the points you are making. My point in both the sea level rise and ice free arctic was that neither of those predictions are based on any sort of rigorous science. Hansen flat out said that it was not a scientific statement but basically something that was not impossible. The 2015 (past estimates after 2007 even had 1012 as the date) appear to be based solely on extrapolation, which again is not rigorous science. It is possible so might be correct. In my amateur view both predictions are highly unlikely. But my point was that climate scientists have questioned those predictions and some have been more dismissive than I am being. Whereas on the denier blog sites there is almost no criticism of any attack on ACC no matter how outlandish, anti scientific or mutually exclusive of other arguments.